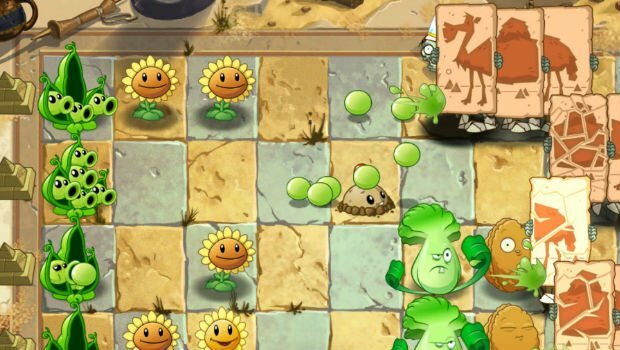 Plants vs. Zombies launched in 2009 on the PC and absolutely changed the face of tower defense games. It was a cultural phenomenon, inspiring even the most infrequent of gamers to play for hours on end, popping off one zombie's head after another with reckless abandon. 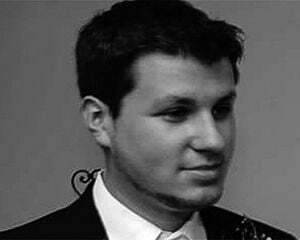 But the original game was also a premium purchase, and with $20, you got every bit of content right away. The sequel, Plants vs. Zombies 2, offers up a very different approach -- it's free-to-play only, and, at first, it's launching exclusively on iOS devices. 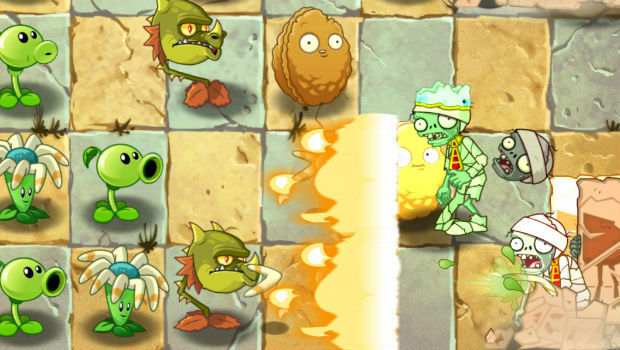 Everything about this approach has disaster written all over it, but somehow, Plants vs. Zombies 2 actually pulls through mostly unscathed. Plants vs. Zombies 2 starts off innocently enough. Just like the first game, you'll defend your house in a grid-based fashion from a typical zombie horde, using the same basic plants and structures. Then your neighbor Crazy Dave has to go and eat a taco. But it's not just any taco, as it happens to be the best taco ever made -- and good enough to go back and time for. Of course, Dave's talking time machine doesn't quite work as planned, and you end up traveling across time and space, battling zombies for no apparent reason. Without a doubt the entire narrative is just an excuse to travel through time and explore various historical locales -- but that's completely okay with me, because time traveling happens to be a ton of fun. Actually playing the game is just as easy as the first, simply collecting sun to pay for and place towers (plants). 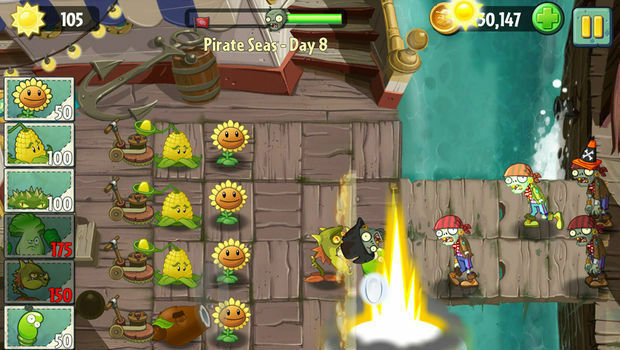 In addition to the same tried-and-true strategies of the original (placing sun-producing Sunflowers in the back, with Peashooters in the middle to fend off zombies), you'll encounter a ton of fresh faces, like the Bonk Choy, a melee fighter that can't shoot projectiles, but packs a huge punch if properly protected, or the Spring Bean, a unit that can launch zombies into the water for an instant kill. You'll traverse across three worlds in the launch edition of the game, including Ancient Egypt, the Pirate Seas, and the Wild West. Each realm has specially themed zombies, like a Pharaoh-suit zombie that uses the staff of Ra to steal sun, and so on. 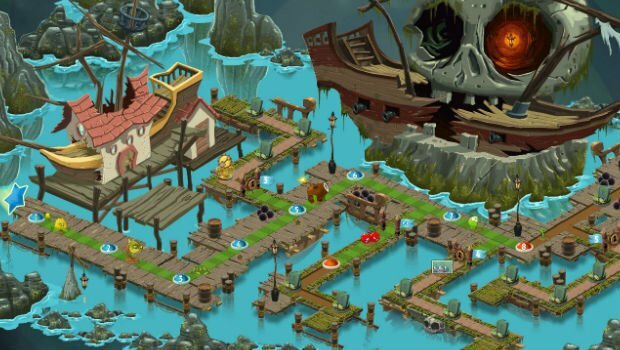 But different shades of zombie aren't the only variants in these new levels, as there are also unique mechanics like limited space and planks in the Pirate world, and maneuverable mine carts in the Wild West. You can buy every level outright with an in-app-purchase, or you can just go through the game in a linear fashion. Thankfully, I didn't encounter paywalls of any kind that were progress related, so it is definitely possible to clear Plants vs. Zombies 2 without buying stages. Unfortunately the mini-game selection is pretty skimpy and you'll only get to occasionally experience a fresh gametype, which is a big step down from the cavalcade of diversions in the original. 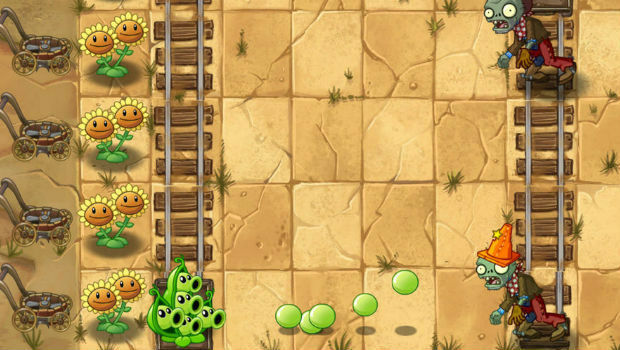 If you've played Plants vs. Zombies on a touch device, you've arguably played the best version of the game, and the smooth control scheme faithfully translates into the sequel. All you have to do to place plants or collect sun currency is to tap them, or tap wherever you want your plants to go. I had zero issues controlling the game on an iPad given the larger screen real estate, and outside of the occasional mis-tap on the iPhone, I didn't have much trouble in general. The brand new mechanics in It's About Time also work great with a touch screen. These come in the form of plant food that buffs one unit at a time temporarily, and offensive magic powers (inconsequential things like pinching zombie's heads off) that cost gold to cast. Although the powers are a pretty throwaway addition, plant food is easily my favorite welcome change for the sequel, as it adds a whole new layer of strategy that wasn't present in the original. Now, instead of simply planting your towers in a perfect formation and calling it a day, you can use plant food to spring special powers that are unique to every single plant. For instance, the Sunflower will generate more sun power on the spot, the Cabbagepult will launch projectiles randomly across the entire map, and the Wallnut will don a suit of armor for extra defense. Knowing when to use these abilities (and on what plants) is key to your success in Plants vs. Zombies 2, and it kept me a bit more engaged in some of the later levels. Plant food isn't an IAP-only item, either -- throughout each map, defeating glowing zombies will earn you single-use packets of plant food. You can also restock plant food or use powers by spending in-game gold (which I'll get to later). As you may have noticed from the info box above, the game is free -- so it has terrible microtransactions, right? Well, surprisingly, not really! At least, not yet it doesn't. The only content that's walled off is a small selection of plants for $3 each -- mostly legacy plants from the first game (the Squash, Imitator, Snow Pea, Jalapeno, Torchwood, and the Power Lily) that won't make or break your enjoyment in the slightest. Of course, it's always possible that EA will add "freemium" unlocks for other worlds and crucial plants down the line, as the game is already hinting at future updates. As it stands I'm actually quite surprised at how well IAPs have been handled in Plants vs. Zombies 2, especially given the fact that it's free. There are other microtransactions available in the form of boosts (like starting with more sun), and the ability to straight-up purchase gold. Again, these IAPs do not break the game, as you can still very much complete the entire experience without them. Having said that, they're basically cheats you can pay for, and the gold costs are so high that it's very unlikely you'll be able to use them consistently without paying real money, if that matters to you.